Become a part of Domaine Serene’s exclusive community and experience the privileges of access to a world-class wine estate. 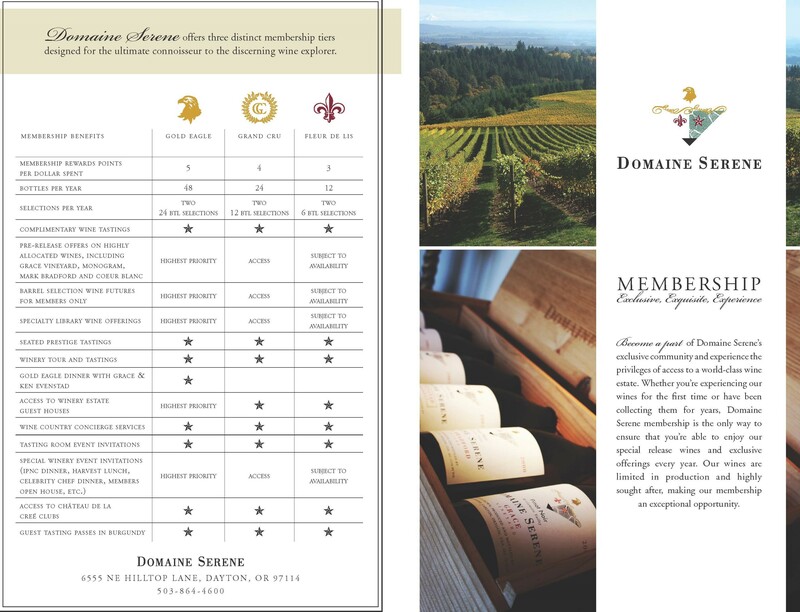 Whether you’re experiencing our wines for the first time or have been collecting them for years, Domaine Serene membership is the only way to ensure that you’re able to enjoy our special release wines and exclusive offerings every year. Our wines are limited in production and highly sought after, making our membership an exceptional opportunity. For the true connoisseur of Domaine Serene wines, the Gold Eagle membership unlocks the cellar door to the highly sought after “gems” in the portfolio as well as providing privileged access to the winery estate. The Grand Cru membership is designed for the discerning wine aficionado seeking a curated collection of exclusive wines and priority access to unique events. The Fleur de Lis membership is the best way for the inquisitive arbiter of good taste to explore our portfolio of award-winning flagship wines as well as a selection of membership-exclusive bottlings. 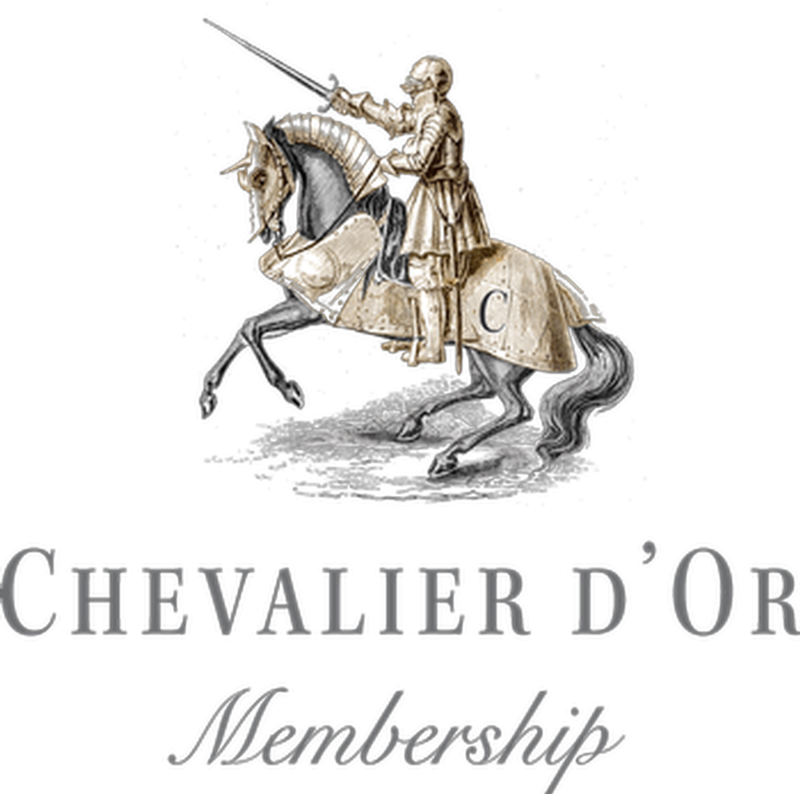 Designed for the true aficionado, the Chevalier d'Or membership is the perfect complement to your current selection of Domaine Serene wines. The Fraternité de la Crée membership is an invitation to explore the wines and estates of Château de la Crée and Maison Evenstad. Domaine Serene continues to lead the way in hospitality by providing the most memorable experiences and value to all wine club members. Membership Rewards was created as an additional value to benefit all active members, at no additional cost. Through this enhancement, each active member receives members-only access to an exclusive menu of unique packages at our estates and beyond. Depending upon your level of active Domaine Serene wine club membership, for every dollar that you spend with Domaine Serene and Château de la Crée on wine club shipments, wine and merchandise, you’ll earn points redeemable for exclusive Membership Experiences, Domaine Serene Merchandise, and so much more! Please contact us today to learn more about the Membership Rewards Program. *Rewards Points may not be used for wine purchases, shipping, taxes, are non-transferable, and are not redeemable for cash. Redemption must be done over phone, email, or at one of our estates and cannot be processed online. For a full list of redeemable items, please contact your Domaine Serene representative today at: 503.864.4600 or by email. Experience the benefits of Grand Cru and Gold Eagle membership with our Private VIP Tasting and Tour. Delve deep into our story and portfolio with your personal host for the afternoon, beginning with an outstanding Clubhouse and Winery tour and culminating with a flight of limited-production Domaine Serene and Maison Evenstad wines in one of our intimate private spaces. Available by private invitation or with advance booking only, these exclusive tastings are available on a limited, case-by-case basis. Gold Eagle and Grand Cru Members receive one complimentary group private tasting annually. Limited to groups of six or less, please. To enroll in Gold Eagle or Grand Cru Membership and inquire about availability for your preferred dates please use the link below.